To study the culture of succulents under local conditions. To strive to use the correct scientific nomenclature for succulents. To study the use of succulents in landscape and home gardening. To aid in civic projects involving succulents and promote protection of native species. To aid and give assistance to educators, to the members, and to the general public, thereby furthering the knowledge of succulents. 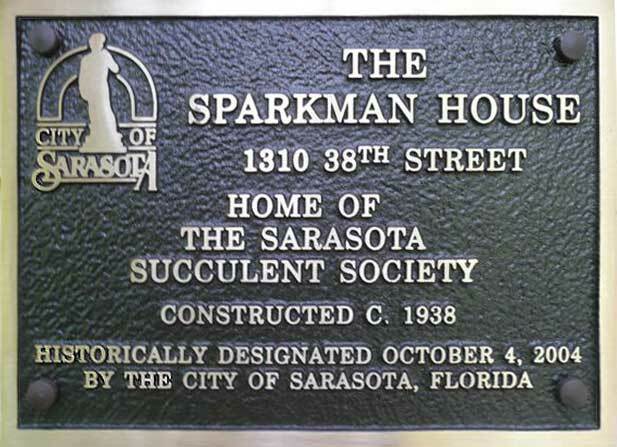 More than sixty years ago, the Sarasota Succulent Society was started by an industrious and interested group of people who knew, worked and studied with Walter G. Sparkman at his home, a small house on 38th Street next to a creek. Mr. Sparkman started many individual gardens in his yard and carefully filled them with succulent plants from around the world--which he studied and watched carefully to see if they could grow in Sarasota. After his students began to fill the yard with more and more families of plants, he suggested they form a club and buy more property--the lot next door had come on the market. They did so, and when the drainage ditch was dug, along the site of the creek, the rock and sand removed was left in piles on the bank on the Succulent Society property. These rocks and berms were incorporated into the gardens and have made a rolling property from a very flat section of west central Florida. 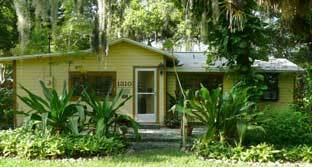 The Succulent Society property runs from 38th Street south to Myrtle and extends from Cocoanut east to the drainage canal. Mr. Sparkman's depression era style home was awarded a local Historical Designation and is presently under renovation. We use it as our clubhouse. The Sarasota Succulent Society is incorporated under the laws of the State of Florida and it is registered with the federal Internal Revenue Service as a 501(c)(3) Charitable Organization. We have a Scholarship Program for local college students and we regularly offer free educational programs in our gardens. Please contact our president for details about the many convenient ways you can make a tax deductible contribution to our efforts. We are always looking for new volunteers to bring fresh energy and new ideas to our organization. Although volunteering is not a requirement for membership, the Society depends 100% on its volunteers to function. As a member, or prospective member, we ask you to please consider helping maintain the vigor of the Society. We think you will find the work enjoyable and personally rewarding. View our current volunteer opportunities here. Everyone is invited to receive our Newsletter. We send fresh news to our subscribers about once every month, except in July, August, and September, when, by tradition, we suspend many of our activities. We promise we will not share your email address with any third parties, and, if you ever decide you want to stop receiving our Newsletter, there will be an "unsubscribe" link at the bottom of every edition. To see samples of previous issues (our 20 most recent editions) visit this page.